In attendance were Fernand, Robert, John, Pat, and Patrick. As usual, we gathered to enjoy a good cigar and give our opinion on it by holding a 'group tasting' following dinner. The five of us dined Southern Style on an amazing feast prepared by Fernand’s wife Debra, consisting of pulled pork (in two flavors), garlic-cheese grits, and fresh coleslaw; all washed down with some tasty homebrew. This was followed by peach cobbler and espresso shots before heading out to Fernand’s back patio to conduct the cigar tasting session and continue the evening’s relaxation and camaraderie. Our selection for this Herf was the Litto Gomez Diez 2008 Chisel Puro. A unique, flat-tipped creation by Litto himself, it measures 5 1/2 inches long by a 54 ring guage. This LG Diez Chisel was Cigar of the Week back on January 19th and received a 93 from Cigar Aficionado's expert tasting panel. No cutters were used to kick things off. Instead, a gentle pinch on the sides of the tip popped the wrapper open. The cigars were all a little stubborn during the lighting. Perhaps this was due in part to being stored at a slightly higher humidity level. Unfortunately, a couple of the stick drew too tightly, and not a fault of the tip either, as was easily verified by a quick test clip. Other than that, there were no construction issues to speak of. Clearly, Litto has got some very skilled torcedores crafting his chisels. Everyone commented on what a pleasurable flavor profile it started out with; woody & smooth, yet very flavorful with a slight sweetness. There was a definite note of fruitwood on the pallet that we enjoyed very much. A little more smoke output would have been appreciated and the ashes were mostly stable and rather light in color. The cigars did have some burn issues with most requiring relights or touch-ups for the duration. The flavors were the best part of the cigar while it’s smoking characteristics were it’s worst. While the performance issues were a bit of a let-down, all agreed that we’d like to try more products from Litto (and more chisels) in the near future. After throwing out the highest and lowest, then averaging the remaining scores, The Cohiba Club's official rating for the LG Diez 2008 Chisel Puro is 88. An excellent cigar. 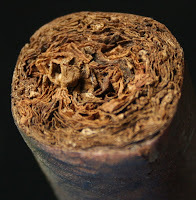 All in all, a pretty enjoyable cigar (considering the burn & draw problems) which we recommend that you try for yourself, as the flavors alone are worth it. See you at the next herf, May 3rd.